The Children’s Rosary has a Commitment to Including Children of all Abilities. The Children’s Rosary is a prayer group movement for children. Looking back on the first meeting of the Children’s Rosary on April 10th 2011 it would seem Our Lady always intended children with disabilities to have a special place in the Children’s Rosary. Although the group was small when it began several of the children had disabilities. The group grew in a special way involving children of every ability. As founder of the movement, I too have an inherited disability with my joints preventing me from driving or using my hands for many activities. Two of our three children have disabilities: one an inherited physical condition that is progressive in nature and our other child suffering from Attention Deficit Hyperactivity Disorder (ADHD). So indeed there was an awareness that children are called to prayer no matter what their abilities. In a special way we have incorporated things into the Children’s Rosary to include children who might be unable to lead the prayers. One example is the inclusion of roses at the end of each decade. 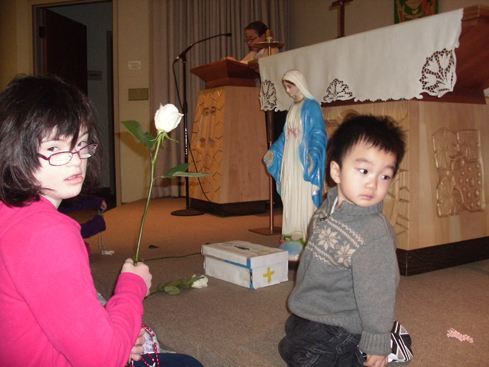 A child is asked to place a rose at the foot of a statue of Our Lady at the end of each decade. This gives children unable to lead prayers a way to show mother Mary how much they love her. The prayer group also provides a wonderful place for children of different abilities to support each other. It is moving to see a little child taking the hand of an older child with a disability and together leading prayers. Likewise, some of the older children also find a sense of belonging when they can help an uncertain littler child. No matter what the age and ability all come together with a heart open to love and prayer. Recently we recorded several Children’s Rosary CDs. A mom of four who leads a Children’s Rosary, shared that her 16 year old son who has Attention Deficit Disorder (ADD) has struggled for years with the Rosary. He would try to pray at home but became frustrated as it was difficult for him to finish and it would take him up to an hour. His mom was looking for something to help him. She received our Children’s Rosary CDs as a gift and her son began using them. He was so excited as he could finally pray the Rosary daily and complete it without frustration. It was then that we began to see the CDs as a resource for those that struggle praying the Rosary due to disability. 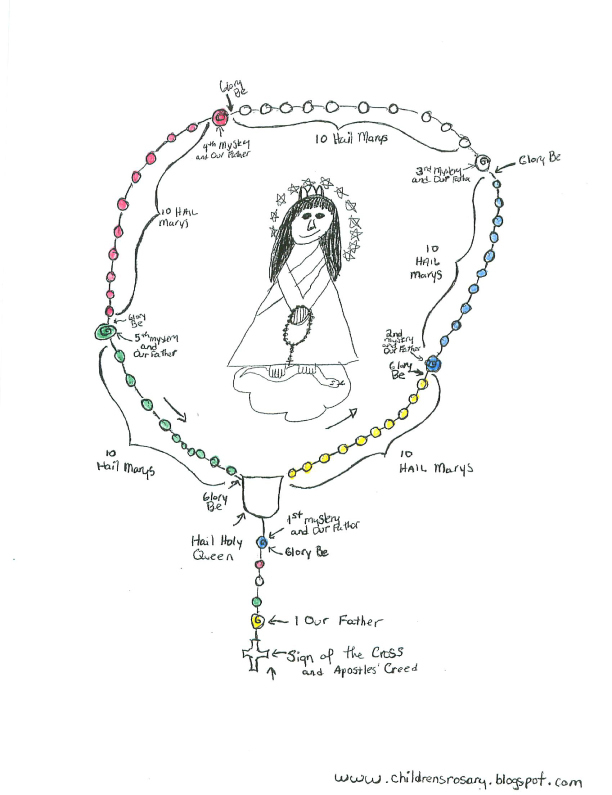 Another resource that we have to help pray the Rosary is a diagram created with help from the children. Recently we also heard that this has been helpful for a child with dyslexia. His mom shared that he began using the diagram which has different colored beads, moving his fingers along the diagram. He found using the diagram helped him pray a complete Rosary! The Diagram can be downloaded and printed. The Children’s Rosary book in English is available in Braille free through the Xavier Society for the Blind. The Xavier society also provides our Children’s Rosary CDs free of charge to individuals who are blind. Several of our Children’s Rosary group leaders are blind and utilize these braille materials in their groups. These group leaders have offered to help other individuals who may be blind and would like to begin a Children’s Rosary. Please contact the Children’s Rosary if you would like to be put in contact with one of these individuals. Our Children’s Rosary instructional videos have been provided with subtitles for those with hearing impairment. We thank all those children and adults who are a part of the Children’s Rosary. We strive to provide materials so that no adult or child despite his or her ability will be excluded from participating in the Children’s Rosary. Thank you all and God Bless.